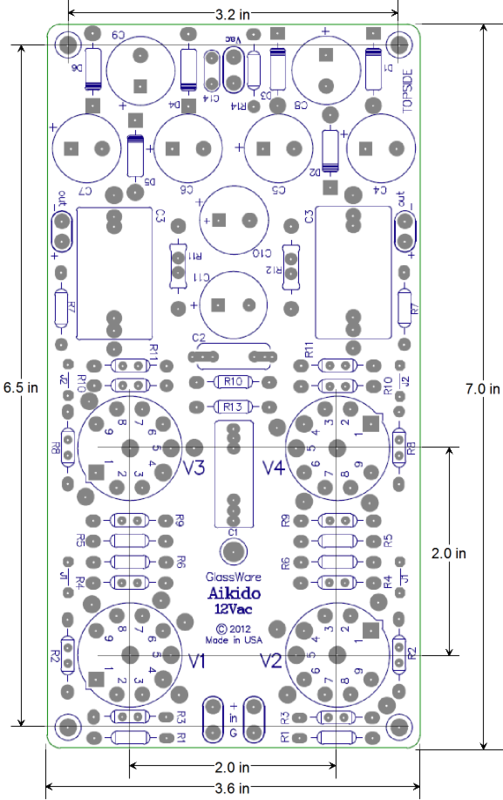 In blog number 251, I gave away a hint that this new Aikido PCB would be soon available. 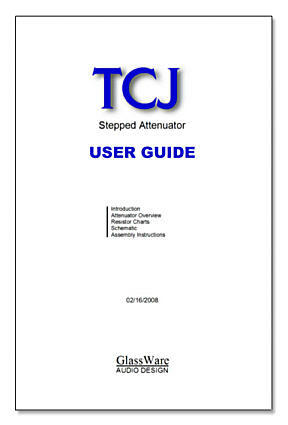 That was back in December of last year, when the A3-Mini three-switch stepped attenuator was revealed, which was over three months ago. 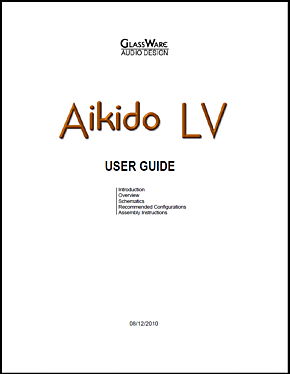 Well, having finally finished its user guide, I can finally release the Aikido 12Vac boards for sale. Why yet another Aikido PCB? A very good question that deserves a very good answer. 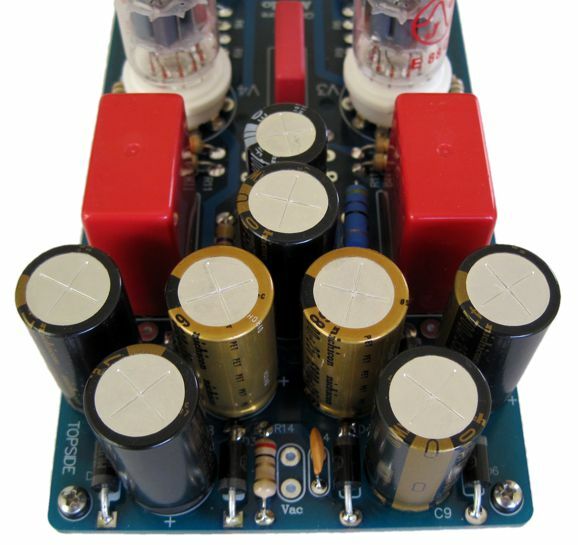 I know that many customers are using four 6DJ8 tubes with the Aikido LV PCB and a 24Vdc power supply, as they write me to tell me about how great their Aikido sounds. Well, here is the thing: I have tried using 6DJ8 with 24Vdc and they sound so much worse than the 6GM8 tubes in the same circuit that I would never recommend the pairing. 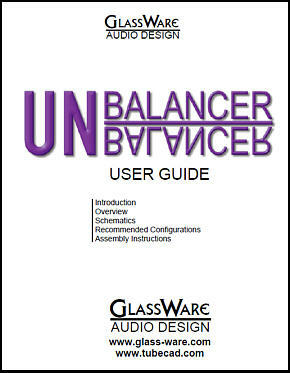 Yes, yes, I know that their setups my indeed sound much better than their previous solid-state or tube line stage. The solution is more B+ voltage. 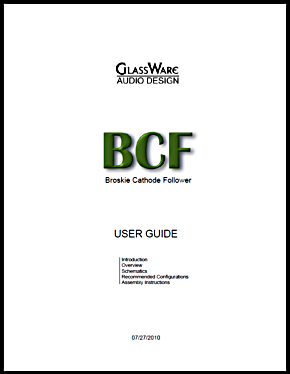 But how do we retain the advantages of low-voltage and still get a decent B+ voltage? Well, the Aikido 12Vac is my solution, as the key advantage of the Aikido 12Vac is that it can be operated from a lowly wallwart power supply, yet develop a fairly high-voltage B+ for the triodes. 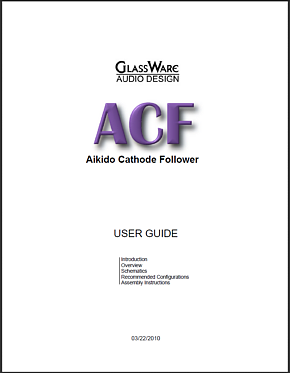 Where the typical tube-based line-stage amplifier requires a B+ of 200V to 400V, the Aikido 12Vac can get by with only a B+ voltage of 80Vdc with 6DJ8/6922/E88CC tubes; or 120Vdc with 12AU7/ECC82/ECC802 tubes. The heaters are all placed in series and this heater string is powered by a portion of the the B+ power-supply voltage, the center third. Thus, a wallart's low-voltage AC from is all that is required to power the Aikido 12Vac. The power supply is internal to the 12Vac Aikido PCB and receives its power from an external transformer, usually a 12Vac wallwart. 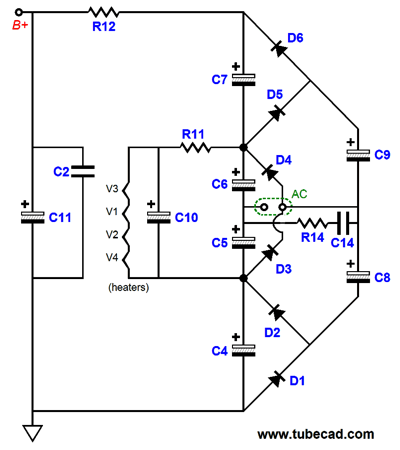 The 12Vac voltage runs through an elaborate sextupler circuit that develops both a high-voltage B+ and a DC heater voltage. If you guessed that 12Vac became 72Vdc, you missed by 1.414 times, which is the square root of 2. A 12Vac sine-wave actually peaks almost 17Vpk, so the actual DC voltage developed is equal to 6 x (12 x v2 – Vrect), where Vrect is the rectifier’s voltage drop. 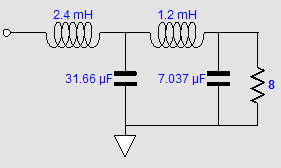 In other words, the sextupler creates a raw DC voltage of about 92Vdc. !!! 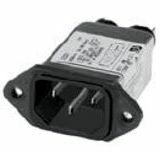 IMPORTANT: If a metal power jack is used to receive the AC voltage from the wallwart's power plug, it must be fully insulated, as the incoming AC voltage is referenced to half the raw B+ voltage. In other words, the plug's outer barrel must not be grounded. Note how the power-connecter jack is all metal, so I had to insulate it from the chassis with a nylon shoulder washer. Of course, the easier way to go is to use an insulated power jack. If an 18Vac input voltage is used, a raw DC voltage of about 148Vdc is created. 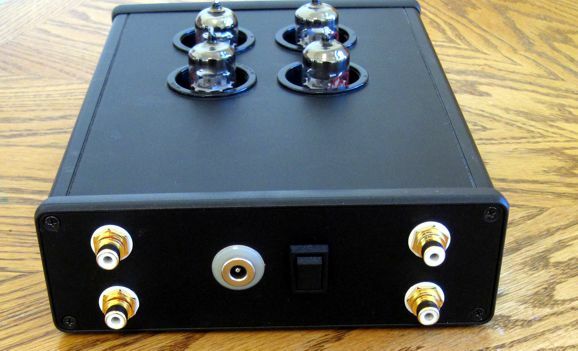 The 92Vdc voltage is perfect for use with four 6DJ8 tubes; the 148Vdc, with four 12AU7 tubes. 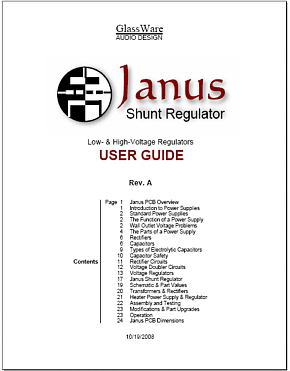 The 12Vac transformer used with 6DJ8 tubes must provide at least 1.5A of current, which equals a VA rating of 18; the 18Vac transformer used with 12AU7 tubes must provide at least 1A of current, which equals a VA rating of 18. Ideally, a transformer with a good regulation figure (say the 5% to 10% a good toroidal transformer would offer) would be used; this is unlikely to true of a wallwart transformer, however, so some adjustment of the RC filter resistor values (R11 & R12) might be needed. 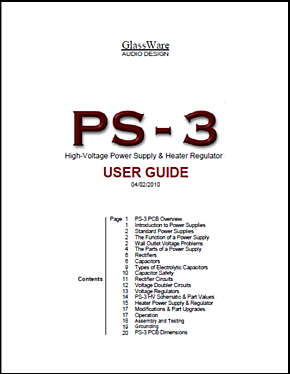 The heaters must not see an over voltage, as such a voltage will greatly shorten the tube’s life. 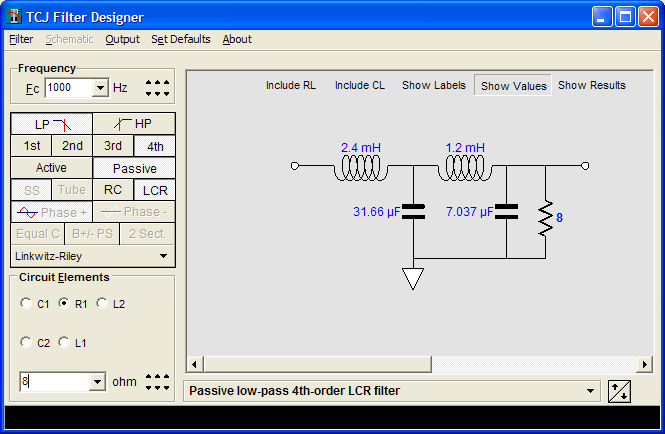 The raw high-voltage is cleaned up by an RC filter made up of R12 and C11 in parallel with C2. 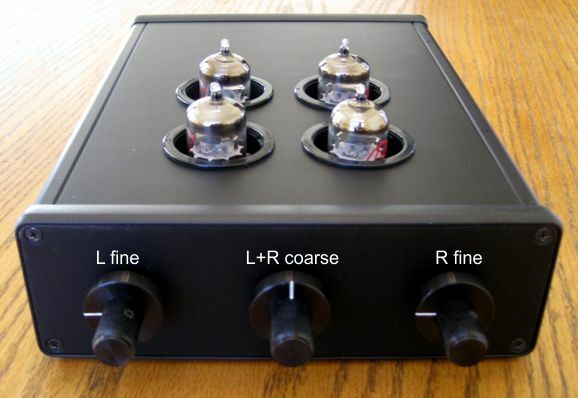 The four tube heaters are in series with each other and get their own RC filter made up of R11 and C10. Resistor R14 and capacitor C14 define a snubber circuit for any RFI that might be present on the incoming AC voltage. 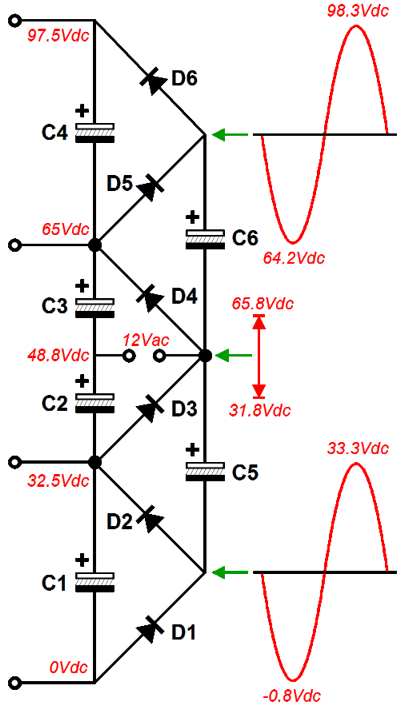 Most tube fanciers know about voltage doublers, but few have heard of sextupler circuits. 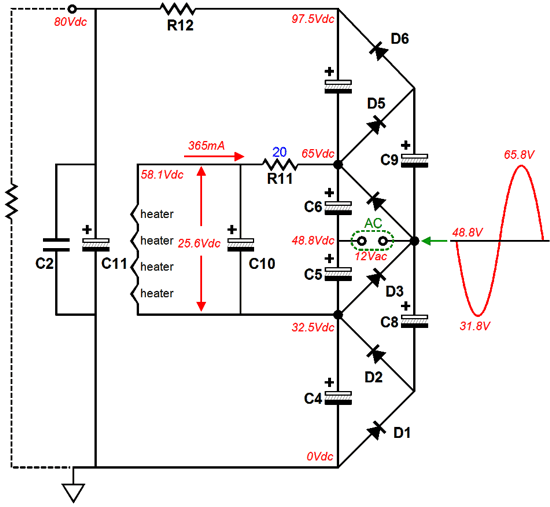 Where a voltage doubler circuit creates a DC voltage equal to twice the peak AC voltage, the sextupler circuit creates six times the peak AC voltage. The key word in the last sentence was "peak," as AC sine wave voltages are measured in RMS values that are mean to match the equivalent DC voltage in created heat in a resistor. For example, a 10Vdc power source will produce 10 watts of heat when applied across a 10-ohm resistor, as W = V²/R. To get the same 10 watts of heat from a sine wave, the wave must peak at 14.14Vpk; this much AC voltage equals 10Vac in RMS terms. In other words, we divide the peak AC voltage by the square root of 2. If the waveform is a square wave or triangle or saw tooth wave, a different formula is needed. 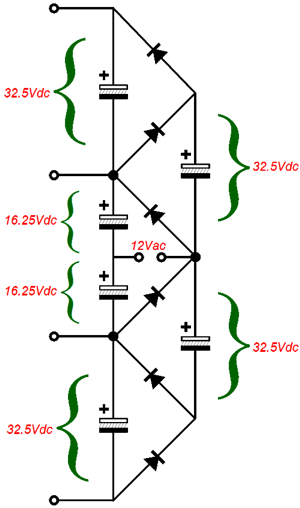 Below we see the voltage relationships that develop from the 12Vac voltage. The secret to understanding how this circuit works is to realize that the two rightmost capacitors bounce up and down due to the 12Vac voltage swings, while the four stacked capacitors on the left remain locked in place, in terms of voltage. Next, realize that as each of the six rectifiers becomes forward biased, it begins to conduct, which charges the capacitors. 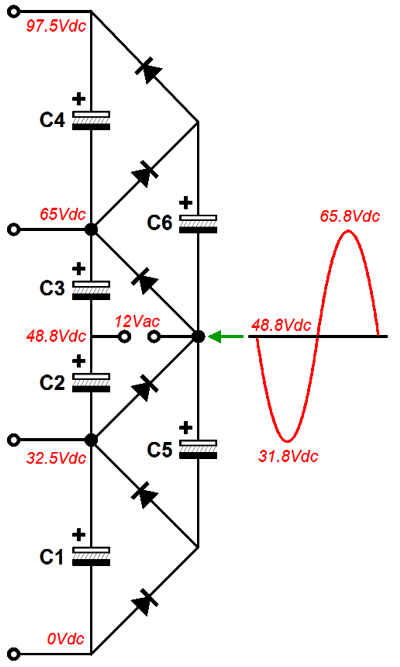 Remember that capacitors C5 & C6 charge up to 32.5V each, so when the nexus between them swings down to 31.8V, the bottom stator of C5 becomes slightly negative relative to C1's bottom stator, causing the bottommost rectifier to become forward biased, allowing it to conduct. 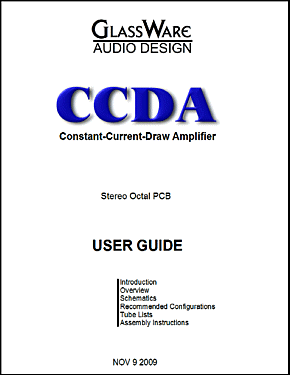 And when capacitor C6's top stator swings up to 98.3V, rectifier D6 becomes forward biased and conducts, allowing C6's charge to flow into C4. Now, let's look at the complete power supply circuit with the heaters in place. The assumption is that four 6DJ8 tubes will be used. Note how all four tube's heaters are all in series and how the heater string is referenced to 32.5V above ground level. Also note how the resistor R11 drops about 7V, so the heater string sees 25.2Vdc. This resistor also prevents huge current inrushes at start-up, when the heaters are cold and, as a result, offer little resistance; this resistor will extend the tube’s life. Resistor R12 and capacitor C11 (in parallel with C2) define an RC filter for the B+ voltage the tubes will see. If 12AU7 tubes are used, an 18Vac wallwart will be needed and the following voltage relationships will result. Note how each 12AU7 only gets 12Vdc across its heater element. If a 20Vac wallwart could be found, then more heater voltage would be available. But, in fact, a 18Vac wallwart will probably suffice. Such transformers offer very poor regulation, which means that their unloaded voltage is much greater than their loaded voltage. For example, unloaded, the 18Vac wallwart might put out 23Vac. So, if we use an 18Vac wallwart that is just a tad over specified in VA for this task, we will get enough raw heater voltage to give each heater 12.6Vdc. Speaking of wallwarts, AKA wall adaptors, Jameco Electronics sells an 18Vac @2.2A wallwart for only $8.95; and a 12Vac @1.5A wallwart that offers a accuracy figure of 5% and a regualation figure of 14.8%. 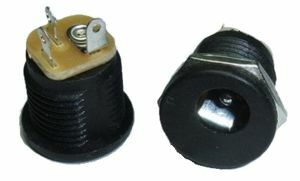 They also sell a 13.5Vac @5A desktop enclosed transformer for only $16.95. Lest anyone believe that I am getting a kickback from Jameco, here is a link to Parts Express who are blowing out a desktop 12Vac @3.5A transformer for only $5.80. In the review section, we learn that the enclosure holds a 500mA fuse, which is a nice touch. The alternative to the wallwart is to use a transformer, such as a frame or toroidal or R-core type, in the same enclosure that houses the Aikido 12Vac (or in its own small external enclosure). 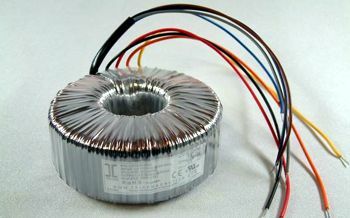 One example is the Triad Magnetics VPT12-2080 toroidal power transformer, which puts out 12Vac CT @ 2.08A and which Mouser sells for $19.68. The above is my preference, as it uses a choke to attach to the house ground. Moreover, you could add a soft-start switch and magnetic current breaker. 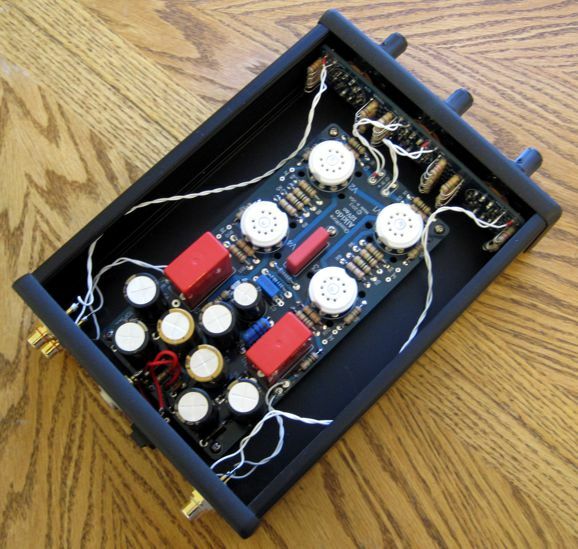 The Aikido 12Vac board holds stereo Aikido line amplifiers. If somehow you don't know what the Aikido circuit is, say Google dumped you here for the first time, the quick answer is that the Aikido tube circuit provides low distortion, low output impedance, and stellar PSRR (power supply rejection ratio)—all without the use of a negative feedback loop. It is both simple and effective. 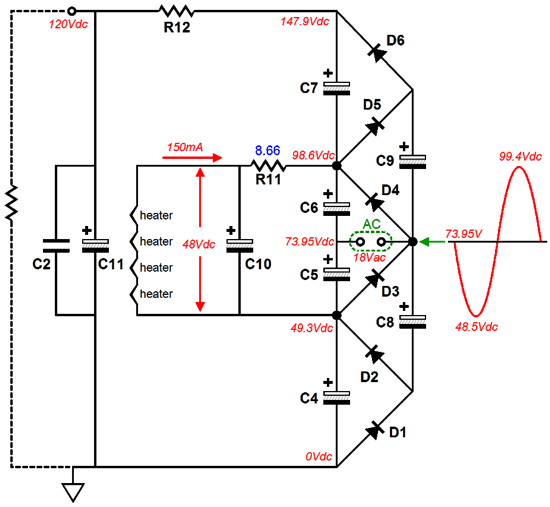 The Aikido circuit delivers roughly a gain equal to half of the mu (amplification factor) of the triode used. With four 6DJ8 tubes (all the tubes must share the same heater voltage and heater current draw), the signal gain equals about 16 or +15dB; with four 12AU7 tubes, 8 or +9dB. This may not seem like much gain, but it is plenty for line-stage use, as most power amplifier require only 1Vpk to be brought to full output. If more gain were required, then a 12AX7-12AU7 or 12AT7-12AU7 combination would yield a gain of 50 and 30 respectively. In my own Aikido 12Vac, I used four JJ 6DJ8 tubes, which provided more gain than I needed and sound surprisingly smooth for a modern 6DJ8. I used a Hammond Manufacturing1455T2201BK extruded enclosure with metal end-caps, which is only 8.66 x 6.3 x 2.03 inches big. When I bought the case, it cost $27, but its current price is $30.18 from Mouser (next yer, $33???). As you can see from the photo below, there's plenty of room for an A3-Mini stereo stepped attenuator (even with the large 1W resistors) and the Aikido 12Vac board. Mind you, I did have to use shorter hex standoffs. Drilling the the front an rear panels was a breeze, as the metal is thin. But punching the top removable panel was work, as it is so thick. Nonetheless, it was one of the easiest projects that I ever put together. And it sounds quite good. All the Aikido magic is there and it is amazingly quiet. 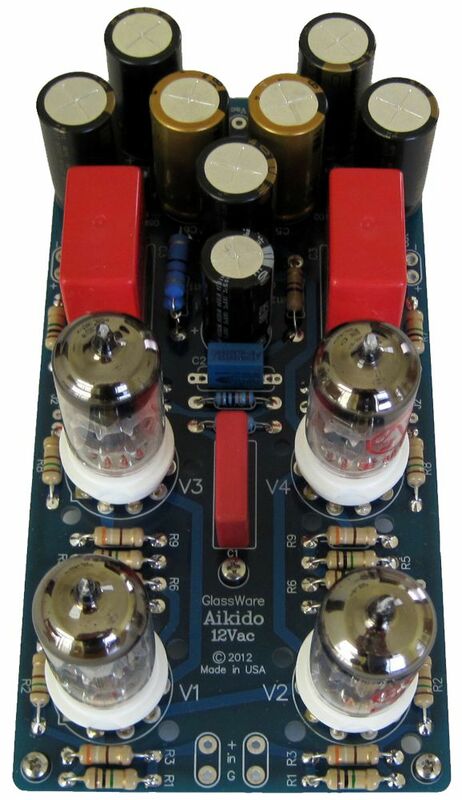 The Aikido 12Vac stereo boards and part kits are available now at the GlassWare/yahoo store for ridiculously little money.